Food Lunch & Eves. Bistro style food. Dining room. 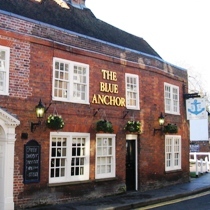 The Blue Anchor in St Albans has recently been modernised (late 2006) and now has separate dining and drinking rooms. The drinking room is at the front on the left whilst the dining room is at the back of the pub. Apparantly the food is not your usual pub food but is high quality classy restaurant style food. At the time of the visit (9:30pm on a Wed) both the restaurant and drinking areas were fairly empty. Real ale choice was a little disappointing as only MacMullans AK and Country were available. The smart interior consisted of wooden tables and chairs and a wood floor with rugs. This is a gastro pub that is fine if you want a high quality meal or a quiet drink but it does lack a little atmosphere. Apparently 'Rusty Anchor' ale has been brewed by McMullens especially for the Blue Anchor.